Leah’s fifteen years of dance experience started unofficially in her childhood living room and officially in the studios of Oregon Ballet Theater, where she trained in the pre-professional program for five years. After ballet, Leah explored other forms of dance, studying most intensively with Tracey Durbin and Maricella Devine (Portland based) in Luigi jazz technique and funk-based hip hop respectively. 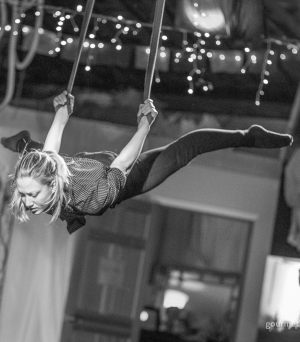 Leah has focused the most recent chapter of her movement life on circus arts, specializing in aerial straps. She received her most formative circus training at the San Francisco Circus Center, under the coaching of Portland-based straps artist Shersten Finley and under the coaching of Cirque du Soleil and Ecole Nationale de Cirque coach Chloe Farah. Leah currently teaches and performs hip hop dance and aerial arts in Seattle, WA. She describes her movement style as gritty, evocative, emancipated and abounding with contrast.